Jon Beltran de HerediaFree-to-play game analytics expert. Developer, author, entrepreneur. Games industry professional since 1997, specialized in free-to-play game analytics since 2013. Professor at U-TAD (Madrid) and UPC (Barcelona) Game Development Master’s Degrees. Raúl HerreroFree-to-play games development and production expert. Game developer, producer, entrepreneur. Games industry professional since 1999, specialized in free-to-play games production since 2011. Professor at U-TAD (Madrid) and UPC & ENTI (Barcelona) Game Development Master’s Degrees. Pioneer of free-to-play games monetization starting at Com2Us with the 2010 hit ‘Homerun Battle 3D’. Jury of the prestigious IMGA awards. 15+ year gaming and entertainment industry leader with focus on design, creative leadership, product strategy, new business, and IP development. Founding member of the Assassins’ Creed franchise. 20 years veteran game developer with expertise in IP Development, Production & Processes and Creativity Management. Coach for anyone who wants to make games. Director of Business Strategy EMEA for GREE Inc.
Lead Game Designer at King (with an indie past!). Bubble Witch Saga 3, +55M downloads, 4.7 user rating. Amir Rajan Indie game developer extraordinaire. Renowned videogames journalist, author of ‘Vida Extra’ book on videogame design, and founder of Geenapp mobile app monetization platform. Journalist with broad experience, focus on Mobile, Technology, Startups and Videogames. Worked for TV channels, newspapers, websites, and radio stations worldwide (Spain, Latin America, Japan and others). Assistant Professor for Tecnocampus de Mataró, UPC and La Salle, specialized in Communication, ASO and Videogames and Technology history. Writer of the book ‘Vida Extra’ – Columna (Catalan) and Grijalbo (Spanish). Book about videogames and game design. Founder of the app promotion platform Geenapp. Featured in Wired Magazine as one of the 100 Best Startups of 2015 and in The Hundert Magazine as ‘One of the 100 Best Female Founders Europe’. Professor at ENTI. Former Epic Games Unreal Engine Community Manager. PhD in Molecular Biology. Comedian. Print, radio and TV journalist specialized in videogames. Innovation consultant, pioneer inventor of idea management and crowdsoursing systems. Director of Sage Ideas at SAGE. Jesús Vacas and Alberto Toledo from AxesInMotion will help us understand free-to-play games economy design. 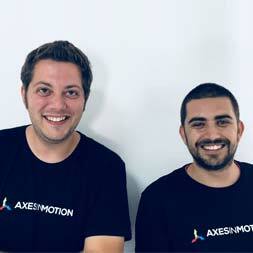 AxesInMotion is a games publishing company from Seville (Spain) that has had 350 million downloads of their games, and are leading several mobile app stores worldwide in genres as important as racing games.